Is it possible to be political and still love flowers? Clouds of Bougainvillea, crimson and magenta, dripping over walls. Roadsides, abundant with oleander, in full flower. 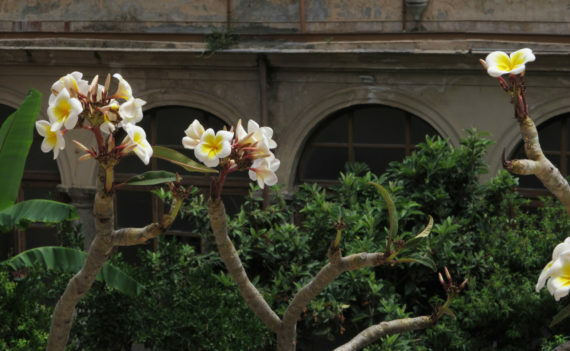 The Plumeria, the flower of Sicily, blooms on gnarled branches in the cloisters of Chiesa di Santa Caterina. Its sweet-spicy scent follows me. Oranges (are they in season? in June?) drop plump on to the ground. Art has a difficulty here in Palermo: it has to compete with architecture (beautifully crumbling palazzi) and verdant nature. We flew into Falcone-Borsellino airport on the evening before the official start of the Manifesta, at the same time as the MS Aquarius, an NGO vessel carrying 629 migrants rescued off the coast of Libya, is on its way to Spain. Later I read this: “14 June 2018, 11:39, Aquarius route changed… Migrant ship… will proceed along the eastern coast of Sardinia to seek shelter from bad weather, otherwise unbearable for the rescued people, already exhausted, shocked and seasick”. That night the paths of our plane probably crossed that of the MS Aquarius on its way to Valencia. The night and my privilege are my oblivion. Leoluca Orlando, the Mayor of Palermo, opens the Manifesta at the Teatro Massimo and declares us, the assembled preview cohort, to be Parlermitans for as long as we stay in his city. I feel overwhelmed/ emotional and astounded by this confident embrace of “borderlessness”. A flamboyant character, Orlando speaks passionately and convincingly of the contribution immigrants have, and are making to the culture of Sicily; immigrants that, as he puts it, chose Palermo as a place to live. I cannot help thinking, “Is there any public figure in Brexit UK that would dare to identify her/himself so very publicly, and so unreservedly with the idea of migration and mobility as a human right?” As a long-term EU resident in the UK, I have now, for a whole year, felt adrift. Here I am offered a home. (Palermo’s mayor had, by the way, granted the MS Aquarius an open port, but was overruled by the new right-wing government in Rome). On my way to Sicily I was concerned about the Manifesta’s emphasis on ‘relational aesthetics’. In my own practice I am an – often solitary – object maker. On arrival in Palermo I need reassurance through objects and am seeking out Berlinde De Bruyckere’s work on the first day. As you enter Chiesa di Santa Venera, a tall wooden barrel shape nearly blocks the entry – the back of ‘Mantel I’. 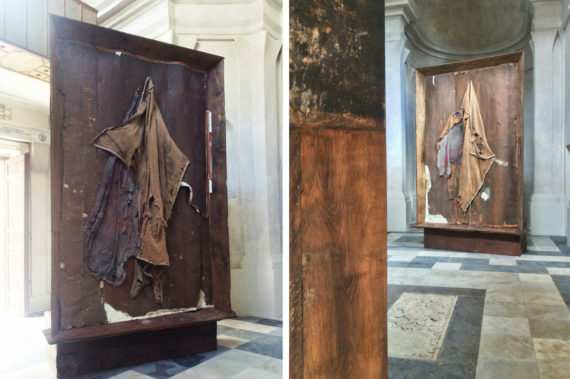 Walking further into this compact, small church, you find yourself between two 4-metre-high framed panels that face each other (‘Mantel I’ and ‘Mantel II’). Browned by age like leather and sliced, it seems, from the interior walls of an abandoned building, they mirror each other’s pain. On the left bottom corner ‘Mantel II’ I count at least eight or nine layers of wallpaper – layers of skin. I have always wondered how frescos are removed, from endangered historic sites – and kept intact – to be placed in the security of a museum. Similarly, a home has been rescued here, scarred as it may be, its wounds only partially covered by what looks like rough horse blankets. Maybe I am looking at the coat of Martin of Tour (the Flemish ‘mantel’ means coat after all). As legend has it, St. Martin, in midwinter, cut his own coat into two and gave half of it to a beggar in rags. I am reminded of Louise Bourgois’ structure ‘Precious Liquids’, (1992). But Bourgois’ rotunda turns inwards, whereas De Bruyckere flays an interior and exposes it like a very large relic. Much smaller in scale than the Venice work, and exposed to the white midday light, De Bruyckere’s Palermo work is not as affecting as ‘Kreupelhout’. Much of the consoling qualities that Bruyckere is striving to hold on to lie in the painted wax surfaces she creates – effectively ‘nurses’ – which are absent in this commission. The brightness of the church is too unforgiving, it ‘bleaches’ this work, and not just visually. (I now regret not having gone back to see De Bruyckere’s work in evening light). I want art to affect me, heart and/ or brain. See the unseen. Manifesta calls itself ‘The European Nomad Biennal’, and it chose for its 12th iteration the theme of ‘The Planetary Garden’. For many artists exhibiting in Palermo that means talking about migration and the crises/ tragedies and – occasionally – the absurdities, that arise out of the ceaseless global relocations of the 21st century. Palazzo Forcella De Seta is occupied by 7 artists/ artist collectives who operate, mostly, through video and new technology installations. (I read that, at one point in its history, Palazzo de Seta was a gambling hall, – there is nothing ‘pure’ in Palermo!). Nearly all works here are concerned with documenting, rescuing and interpreting data; much of it relates directly to place and moment and feels pertinent. “All this information makes good politics, but does it make good art?” asks one reviewer and this is a question that troubles me too. How is it that I am so immersed then, that I am indeed so affected by Forensic Oceanography’s ‘Liquid Violence’? Much of what surrounds me in their space consists of dense texts, maps and diagrams; the technology that has generated this work is undisguised. Regardless of such a ‘factual aesthetic’ I am holding my breath as I follow the fate of the 72 passengers that are condemned to perish in the ‘Left-to-Die-Boat’ by the crime of ‘Non-Assistance at Sea’. The projections are displayed at angles; one seems to slip across the floor. ‘Mare Clausum’ is frightening: it breaks down, in minute detail – with an unforgiving timeline at the bottom of the screen – how politics and bureaucracy kill human life that is already at peril, life that actually could have been saved. I watch two migrants drown in the on-board video footage of a rescue ship. As an experience ‘Liquid Violence’ is quite unlike Christina Lucas’ ‘Unending Lightning’ at Casa del Mutilato. It amounts to a well-intended, marathon didactic effort, installed in a daunting fascist building, yet it could be viewed on your home computer with no diminished effect and possibly much ‘learnt’ in the process. So, where does the difference lie? 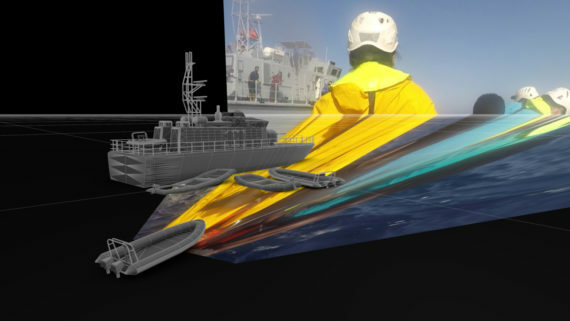 The detail of both Lucas’, and Forensic Oceanography’s research is staggering. Lucas’ projection, however is virtually unmediated, whereas Pezzani and Heller have tenderly worked through the information avalanche and have extracted unheard narratives that attend to individual and very particular lives. Unlike ‘Unending Lightning’ theirs is a conceptually multidimensional, layered work, with an identifiable authorial voice. Forensic Oceanography pedantically dissects the structures that lie behind the devastating number of 16320 deaths* in the Mediterranean – the water once called ‘Mare Nostrum’, ‘Our Sea’. A gentle wind blows into Palazzo Butera from the seafront; it is 3 o’clock in the afternoon and I am drinking infused vodka, infused with Palermo-grown fruits: my drink is Prickly Pear Vodka (with a cherry at the bottom of the glass). Art collaborators Fallen Fruit have furnished the palatial room I am standing in with a bright, digitally produced wallpaper, a lush, sprawling, irregular pattern of exotic fruits, flowers, seeds and foliage expanding across all four walls and the curtains. The distress of the building has been covered up – which is what wallpaper is so good at. Is it the alcohol, or is it an accident of fashion? Many visitors wearing dresses and shirts in the bold floral designs of this season start to blend into the surroundings of ‘Theatre of the Sun’. I take photographs. This is pure pleasure. There is a map which documents the locations of the fruit that make up the infusion and the imagery of the wallpaper. I am drinking the walls, it seems, I am drinking Palermo. Recording Palermo’s overlooked and ignored resource of fruit in public spaces – for all of us to gather – is part of Burns’ and Young’s global project ‘Endless Orchard’. Is this just a gaudy and baroque piece of theatre? Is this more or is it less outrageous than the marble extravaganza of Chiesa di Santa Caterina? Is art still allowed to celebrate? “In the dark times / Will there also be singing?” asks Bertolt Brecht in the 1930’s (whilst in exile in Denmark), and he answers: “Yes, there will also be singing/ About the dark times.” De Bruyckere’s work is Brechtian in this sense. Andrea Cusumano, Head of Palermo’s Department of Culture says: “…contemporary art teaches us, [that] beauty is not something given, but a task to be undertaken.” In 2018, is that task to collect data, alert, act, or will there also be planting/nursing, harvesting, drinking? On 17 June, after a week at sea and an extra 700 nautical miles travelled, the passengers of the MS Aquarius land in the Spanish port of Valencia.